Story: Dominator was an adversary of Blood S.C.R.E.A.M. and the one responsible for the death of Radiance, Mosque and Tabernacle [1-2]. 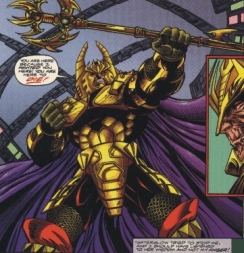 Equipment: Dominator wore an armor which must be assumed to be the source of his enhanced strength and teleportation ability.